One of the hummingbird specimens, before and after conservation. It was cleaned and its beak was recreated. The conservation team has been hard at work conserving hundreds of historic hummingbird specimens for their reinstallation at the Museum at Tring. 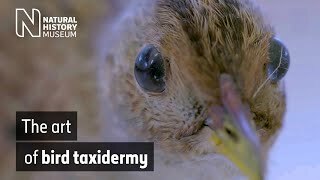 A glass case of over 300 hummingbird specimens has been on display at the Natural History Museum at Tring since the late 1800s. Forty years since its last redisplay, the time finally came for the case and each of its birds to receive some care and restoration. Museum Conservator Chelsea McKibbin has spent six months working on the project, making sure the specimens are looking their best for their reinstallation. The display restoration project began with a condition survey, carried out by the Museum's conservators. The team scheduled time to care for each specimen from the case. The case at Tring before conservation work began. It displays over 300 specimens, including birds, eggs and nests. Chelsea says, 'We were doing a basic clean of all the specimens and if there were any issues with them they were addressed. Cracks in the birds' skins were also a concern as these can be hidden by feathers and can loosen parts such as the head, wings and legs. These were repaired using lightweight Japanese tissue paper and an adhesive. 'Several of the beaks had sustained damage and required stabilising with a conservation adhesive. In some cases a section of the beak was missing, which required a replacement also made out of Japanese tissue paper and adhesive. But it wasn't only the bird specimens that Chelsea worked on - some of the nests in the case were also in need of attention. 'Due to their inherent fragility, they were actively crumbling and required extensive consolidation in order to ensure their long-term preservation. A very dilute concentration of adhesive was applied by pipette to those that could sustain it. One of the hummingbirds before its conservation treatment. Chelsea recreated this bird's beak. The birds' armatures had also deteriorated slightly over their long lifetime, the pins having reacted to fats and oils within the skin. 'The internal and external armatures are made of brass. The metal pins had interacted with the skin and is oxidising, causing the green corrosion product called verdigris. In some cases the quantity of verdigris had disrupted the feather pattern and the plumage was being pushed in an unnatural direction. 'We had to be quite meticulous in our cleaning,' says Chelsea. The octagonal case contains mainly bird skins, representing 100 species - although it also contains eggs and 21 nests. All of the specimens in the case were collected by Oscar Theodor Baron (1847-1926) and were first displayed in the late-nineteenth century. The Tring specimens were likely part of Baron's large collection of hummingbirds from his excursions across North and South America. According to the Tring Museum's first guidebook from 1898, the birds were mounted in the field as they were collected, positioned as they were seen in life. Baron is believed to have sold part of his collection to Tring's founder Walter Rothschild (1868-1937). But fortunately, this collection appears to have been spared when Rothschild sold his bird collection to the American Natural History Museum in New York City to raise funds. 'One of the things we had to be aware of was the size of the specimens. Some of them are so small that it was almost cumbersome to clean them. You had to have really good dexterity. Chelsea was aided in cleaning the hummingbirds by volunteers from among the Museum's staff. The hummingbirds' original case was built in 1893 and has since been displayed in the same location at Tring. It too was due some attention. The case in its original, Victorian state (L) compared to the newly refurbished case (R). The hummingbirds and their case are now back on public display at Tring Museum. The historic case is being returned to its original Victorian state. Over the years, additions have been made, such as strip lighting and Perspex shelving in the early 1970s. The birds will all be receiving new mounts that will make them more stable within the case, and more easily manoeuvrable. A new lighting system is also being installed. 'Originally in the case it was almost like floodlights. The new lighting will be more directional, so that means that the specimens are going to be really highlighted. That's going to be great because they've just been cleaned so they’re really going to sparkle,' adds Chelsea. The hummingbirds and their refurbished case have now been returned to public display at Tring Museum.